In the field of psychoanalysis, more so than in any other discipline, the tension between ‘instituting’ analysis and ‘institutionalising’ analysis is palpable and never more so than when the ethics of its praxis rear up to counter the demand that it conform to a format which is acceptable to the prevailing cultural structure in which it finds itself. To meet with the demand that it take unto itself the identifying features, – the uniform-ity, – of a profession like any other so that it would be ‘at ease’ in society, would certainly miss the rendezvous with the dis-ease inherent to civilisation itself and the effect of socialisation. This risks sounding like the usual (and not terribly imaginative) platitude drawn upon when psychoanalysis finds itself with its back against the wall of ‘others’ forcing it to account for itself in their terms. The debate becomes more interesting however if we remind ourselves that when Lacan was applying himself to Freud a lettre the dis-ease with his theory and praxis provoked an outraged response not from society but from the psychoanalytic society. Here it seems less a question of whether psychoanalysis can be tolerated by society than it is a question of whether those who practice the discipline can tolerate their relation with psychoanalysis itself. A more elaborate reply is evidently necessitated when the societal demand comes not from outside but from within the field itself. What then are the possible responses when in particular there is a demand from within a more or less loose psychoanalytic grouping, (and if the irony of the situation is missed then we have lost our sense of humour), for a … ‘Society’! In short, given the ethics of psychoanalysis, is a society of psychoanalysis possible? This is not an entirely new question for us here in Ireland, – a number of years ago right here in Dublin we were witness to a heated and truly passionate debate by analysts from all over the world on the psychoanalyst’s position with relation to the dictates of the State. If at the time, while finding the debate ’intellectually stimulating’, we were slightly bewildered by the emotional altitudes reached by the protagonists, it is not the case here now. Contour lines on our landscape are changing and we too are beginning to scale new heights! In continuation of the effort to articulate answers to the questions which psychoanalysis never ceases to pose for us, the 1997 November congress of APPI will devote some of its programme to addressing the issue touched on above, taking as its theme ‘Ethics and the object of Psychoanalysis’. 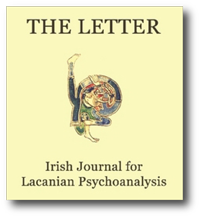 This issue of the journal opens with a paper by Tom McGrath on this very topic of the institution and psychoanalysis which, delivered to last year’s congress, might provide a bridge between it and the forthcoming congress. The least that can be said is that what he chose to speak about under the rubric of ‘Crucial Problems for Psychoanalysts’ has remained as such. Following on this are a series of articles which in one way or another are marked by relations between men. In a curious turn, the first two of these form a pair, devoted to the same clinical material, a case of a homosexual man sent to the therapist by another client also a homosexual man. William Fried generously provides case material which forms the basis for the subsequent paper, a discussion of and commentary on the case by André Michels, – result? – a psychoanalytic ‘man to man’. Barry O’Donnell’s paper on Plato’s Symposium, which is arguably the most famous gathering of men after the Last Supper, will be of interest to anyone who wants a better acquaintance with the backdrop against which Lacan plays out his seminar on transference. O’Donnell, commenting on the intricacies of Plato’s text with Lacan’s work in mind, brings the ‘Classical’ into the accessible realm of the everyday, so much so that the polite rendering of the title into the refined English ‘The Drinking Party’ seems so much less apt than ‘The Booze-up’, and the Ancient Greeks breathe again. Moving from the party banter of men on and in love, we have a paper initially presented to the 1996 November congress of APPI by Phil McAree, who looks at a more intimate and more troubled relation of a man with himself and at the mortifying effect, in the most tragic sense of the term, of one man when faced with his own image, ironically drawn by man who would not tell his name. We find here the case of a man confronted this time not with his image but with the first signifier given to him, his very own word. As always, we find that the word he kept hidden in his ‘Pandora’s box’ was only important in that keeping it hidden covered over the real secret, not the name itself but the box ‘it’ had emerged from. In her discussion of Stevens, the central character of Kazuo Ishiguro’s novel The Remains of the Day, Eithne Lannon’s contribution shows that the secret that there is a subject is least well kept in the attempt to hide this. Ishiguro’s work shows a ‘man put on show and delivered up by his language’ in spite of all his efforts to eradicate any sign of his subjectivity. Here we have Stevens the Son eclipsing Stevens the Father, mastering the art of butlering, maintaining himself as non-subject, hear- no-evil-see-no-evil-speak-no-evil. By total subjection to the rule of the house, he attains a mastery by mastering being mastered, ultimate shadow and servant of the Other par excellence. Living as though he were dead, he is ‘totally committed to the institution’. Our final paper provides an opportunity for a modern Greek to take Homer to task in relation to his political theory. Yannis Stavrakakis replies to Sean Homer’s paper (issue 7), suggesting that if Lacan is right in suggesting that there is a way of being beyond neurosis, beyond identification, then perhaps there is also the possibility of a politic beyond ideology. And a ‘Society’ beyond ideology?